The Mercedes E-Class Wagon also continues is decades-long triumph unabated with the new S 213 model series. Of course, BRABUS (Brabus-Allee, D-46240 Bottrop, phone + 49 / (0) 2041 / 777-0, fax + 49 / (0) 2041 / 777 111, Internet www.brabus.com) offers an equally extensive and fascinating refinement program for the demanding owners of this wagon. The broad product range covers all fields of exclusive customization: It includes performance upgrades for practically all gasoline and diesel engines, aerodynamic-enhancement components with sporty-elegant styling, sport exhaust systems, tailor-made BRABUS Monoblock wheels with diameters of up to 21 inches with matching suspension modifications, and virtually endless possibilities to trim the interior to the personal taste of the vehicle owner. All BRABUS components come with the one-of-a-kind three-year or 100,000 km/62,000 mile BRABUS Tuning Warranty® (see BRABUS Warranty Terms and Conditions, updated July 2013). Class five-door models ordered ex-factory in standard, AVANTGARDE or EXCLUSIVE specification. They are manufactured on OEM quality from high-grade PUR plastics, ensuring optimal fit and paintability. 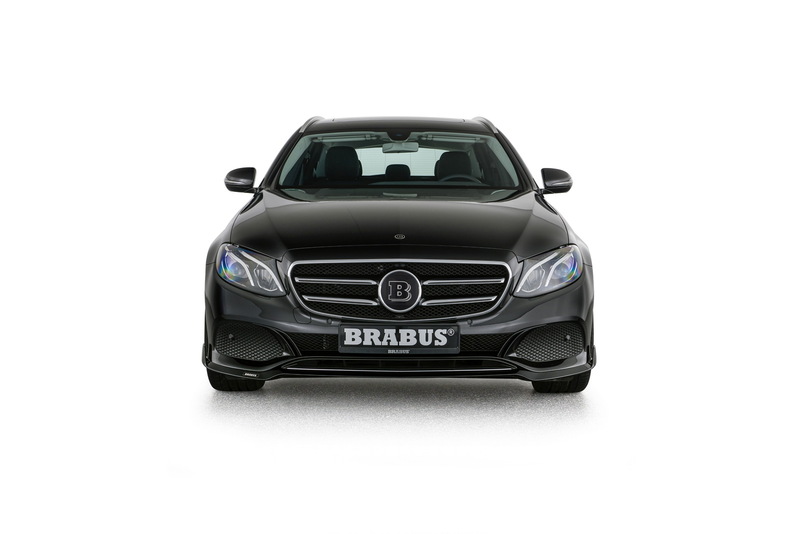 In combination with the BRABUS surrounds for the side air intakes, the BRABUS front spoiler lends the wagon an even more distinctive face. The thrilling looks are complemented by aerodynamic efficiency optimized in the wind tunnel. Thanks to its sophisticated shape, the spoiler, which also fits the sedan, reduces front axle lift at high speeds. 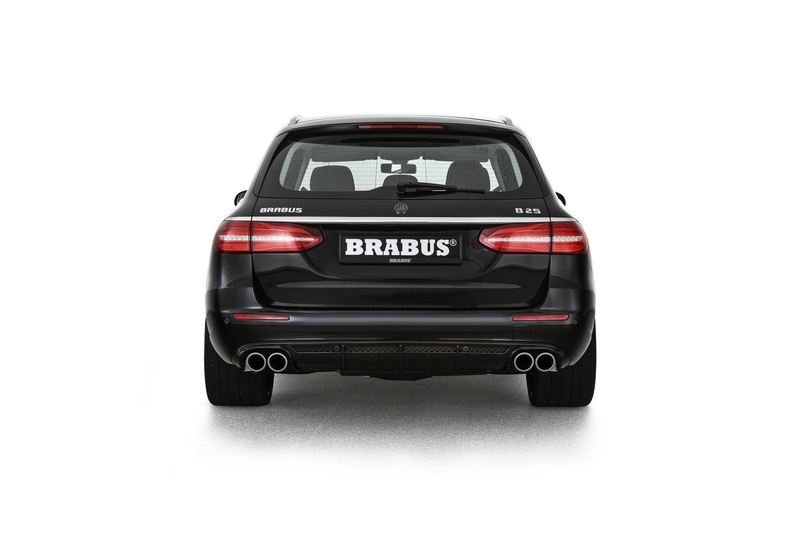 The BRABUS diffuser, which perfectly blends into the rear bumper, gives the rear of the wagon a sporty upgrade. In addition, the integrated cutouts on the left and right provide the perfect backdrop for the BRABUS quad sport exhaust. For the new E-Class Wagons in AMG Line specification, BRABUS offers a tailor-made BRABUS front spoiler and surrounds that add even more sporty emphasis to the side air intakes. A diffuser designed as an insert for the rear bumper will also be available in the near future. Of course, the exceptional appearance of an E-Class Wagon refined by BRABUS also includes tailor-made BRABUS Monoblock alloys. Wheels with diameters ranging from 18 to 21 inches in various styles and designs were safety-certified for the S 213 model series by independent German Technical Inspection Association TÜV. 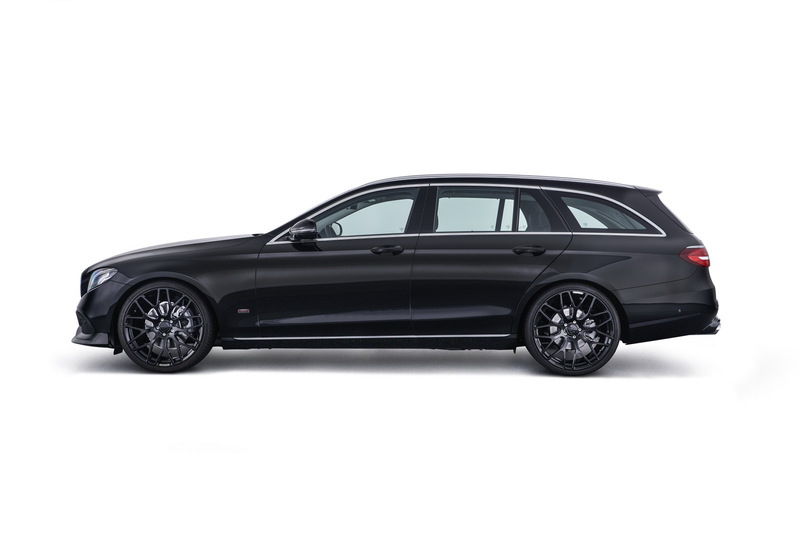 The largest variant to fit the new wagon features forged BRABUS Monoblock F, R or Y “Platinum Edition” hi-tech wheels of sizes 9Jx21 on the front axle and 10.5Jx21 at the rear. BRABUS technology partners Continental, Pirelli and YOKOHAMA supply the matching high-performance tires of sizes 255/30 ZR 21 at the front and 295/25 ZR 21 on the rear axle. The various BRABUS suspension solutions were specifically geared toward the different tire/wheel combinations. 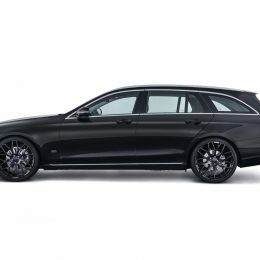 The product lineup ranges from sport springs for a ride-height lowering by about 30 millimeters (1.2 in) to a special control module for E-Class Wagons, which are equipped ex-factory with AIR BODY CONTROL air suspension. BRABUS is the largest provider of performance upgrades for Mercedes-Benz automobiles in the world. The new Mercedes E-Class is no exception of course: The product range starts with BRABUS PowerXtra B20 tuning, which helps the four-cylinder turbo engine of the E 200 to a peak output of 165 kW / 225 HP (221 bhp) and a peak torque of 330 Nm (243 lb-ft). 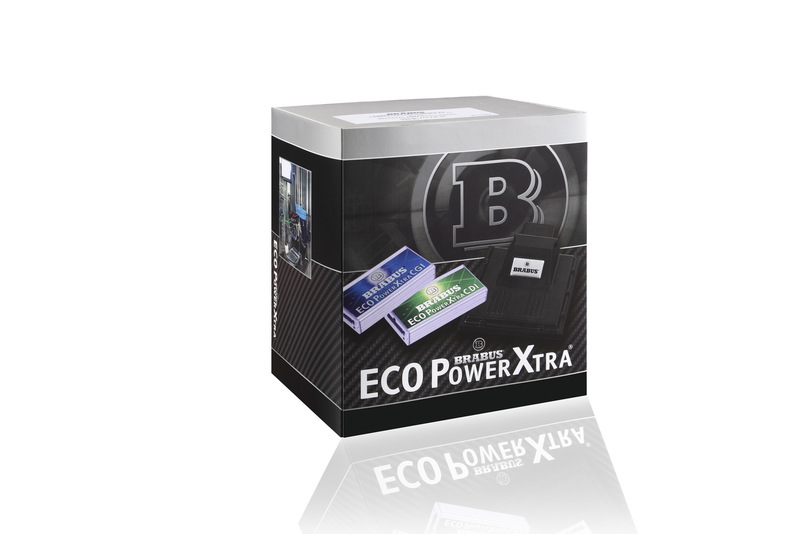 Thanks to plug-and-play technology, the BRABUS PowerXtra B25 performance kit can likewise be connected quickly to the engine electronics of the gasoline-powered E 250 by any specialist workshop. Like all BRABUS PowerXtra performance kits, this performance upgrade was designed to reliably prevent the increase in performance from shortening the service life. The performance-enhancing mapping only becomes active if all parameters such as engine temperature etc. are in the green arc. Equipped with BRABUS PowerXtra B25 tuning, the four-cylinder turbocharged engine of the E 250 puts out an impressive 25 kW / 34 HP (34 bhp) more and adds 50 Nm (37 lb-ft) of torque as well. 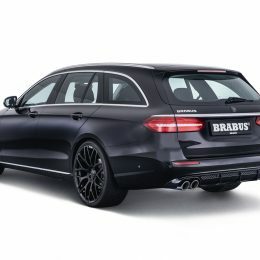 Of course, a peak output of 180 kW / 245 HP (241 bhp) and 400 Nm (295 lb-ft) of torque benefit the vehicle performance: With BRABUS engine tuning, the wagon accelerates from rest to 100 km/h (62 mph) in just 7.0 seconds and reaches a top speed of 245 km/h (152 mph). 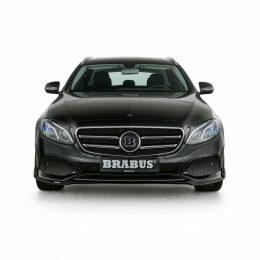 For the most powerful gasoline V-6, the E 43 4MATIC, BRABUS offers the BRABUS PowerXtra B30-450 performance upgrade. It bumps the output of the twin-turbo engine from stock 295 kW / 401 HP to 331 kW / 450 HP (395 bhp to 444 bhp) at 6,100 rpm. Peak torque grows to 570 Nm (420 lb-ft) between 2,500 and 5,000 rpm. The sprint qualities of the tuned six-cylinder E-Class Wagon improve accordingly: From rest, it reaches 100 km/h (62 mph) in just 4.4 seconds. BRABUS naturally also offers significantly enhanced driving dynamics for the various turbodiesel models of the new E-Class Wagon. 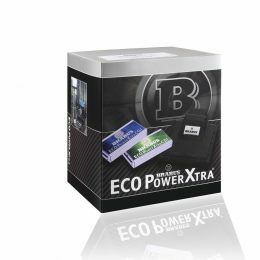 For example, after the installation of the plug-and-play BRABUS PowerXtra D3 module, the five-door E 220 d s produces 20 kW / 27 HP (27 bhp) added peak power and 50 Nm (37 lb-ft) more torque. The performance increase of the largest diesel, the E 350 d, is equally impressive: BRABUS PowerXtra D6 S tuning delivers an increase in peak power by 37 kW / 51 HP (50 bhp) and by 100 Nm (74 lb-ft) in torque. With a new peak output of 227 kW / 309 HP (304 bhp) and 720 Nm (531 lb-ft) of torque between 1,600 and 2,400 rpm, the E-Class Wagon accelerates from rest to 100 km/h (62 mph) in just 5.7 seconds. The top speed is limited electronically to 250 km/h (155 mph). BRABUS recommends high-performance lubricants from Motul. 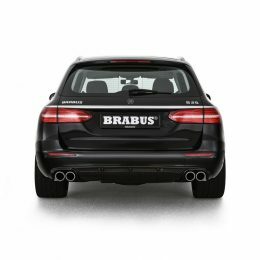 In addition to the enhanced driving dynamics, BRABUS offers a more exciting exhaust note for all engine variants as well. 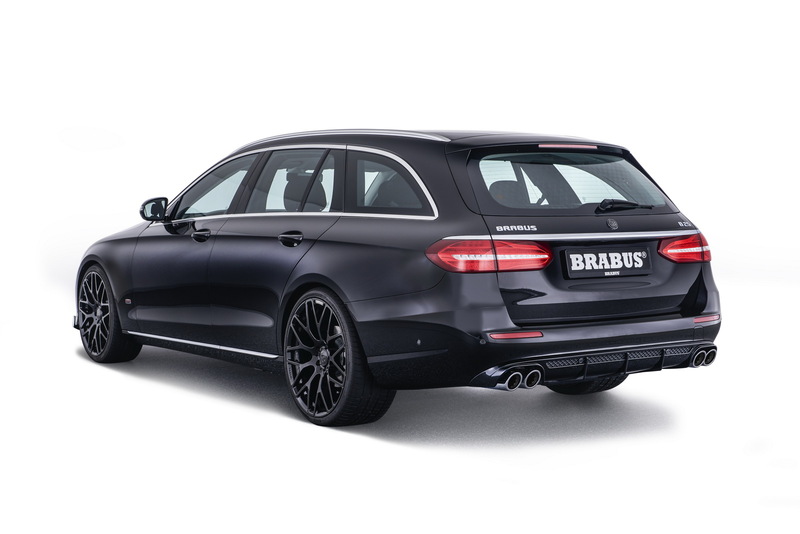 The BRABUS stainless quad sport exhausts also lend the rear end of the wagon more thrilling looks. A variant with controlled exhaust flap for active sound tuning is available for the E 43: At the touch of a button on the steering wheel, the driver can choose between a decidedly subtle “Coming home” mode and an extra sporty exhaust note. 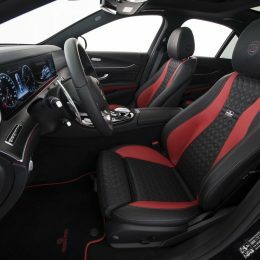 Another BRABUS specialty is the exclusive refinement of the interior in the company upholstery shop. Stainless scuff plates with BRABUS logo backlit in 64 colors synced to the standard interior ambience lighting welcome driver and passengers. Aluminum accessories such as pedals and door pins add markedly sporty highlights. An all-leather BRABUS fine leather interior finished with perfect craftsmanship offers individuality in every nook and cranny. It can be produced in any desired color from especially soft yet durable BRABUS Mastik leather and Alcantara.